With good processes in place, everyone has appropriate expectations and understands who’s doing what by when. This is critical when you’re working across multiple time zones with different countries. But creating these processes can be a challenge, especially if you’re new to your role or your company is just starting to build an international marketing team. Fortunately, Pam Didner has a lot of experience in that area, and she’s generously sharing it with us in her new book, Global Content Marketing. Pam has the pedigree to prove it – she led Intel’s enterprise product launches and worldwide marketing campaigns so she knows a more than a thing or two about how to engineer a successful cross-functional, team approach to developing global content. In a fresh take on the classic 4 P’s, Pam creates a new set of “P’s” for global content creation: plan, produce, promote, and perfect, and gives us steps for each when developing engaging content for global audiences. Who’s Really in Charge: The Regions or Headquarters? One of the biggest challenges in global marketing is figuring out who really is in charge. Is it the regions, who have the eyes and ears of their local market and know it best? Or is it headquarters, where the budget usually lives and corporate messaging and branding originate? Pam has walked this tenuous path so she describes different options for handling it and creating a centralized vs. decentralized structure. This information alone is a very worthwhile reason to read the book as it takes a lot of experience, or a wise mentor, to learn how to best handle this situation without ruffling feathers, alienating colleagues, and missing deadlines. Pam’s philosophy is that headquarter’s role is to lead and serve. On a granular level, this means headquarters provides guidance so geographies can execute with a certain level of autonomy. When she ran global launches at Intel, she saw herself as a support person to her geographical counterparts. That philosophy meant she was always able to find a solution with her colleagues no matter how confrontational a situation might have been. In addition to these helpful guidelines, you’ll find case studies with more detailed examples. One of my favorites was a detailed description of Intel’s annual planning process. You might find gems here that you can apply to your own corporate plan to make the process more streamlined and inclusive. 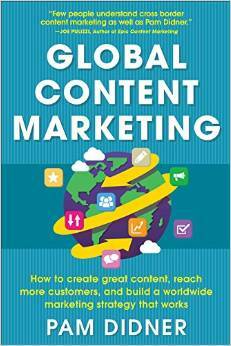 The key takeaway: if you’re responsible for global content marketing, get this book. Where else will you find detailed information on such an important, but niche, function? You’ll save yourself time and headaches if you read Global Content Marketing and follow Pam’s advice.